In my last post I reflected on the near-impossibility of making a simple bike journey safely in the "Bikeless Borough of Barnet", but the truth is that the situation is not that much better in the "Biking Borough" of Brent, or the apparently biking-neutral boroughs of Harrow or Hillingdon, to name those I am most likely to cycle in of the Outer London Boroughs. I believe the rest are similar; evidence from bloggers in East London and South London suggests this is so. I have blogged before on another site about this fantastically frustrating situation: about the total, nutty disjunction between the promotion and propaganda surrounding cycling in UK, and the reality of what those who attempt to cycle discover on the roads. I think I'll reproduce that text here (with corrections), which I wrote two years ago, as it's just as relevant now. Here, the boroughs in question are Brent and Harrow. And lots of people do want to cycle. But then come the practicalities. A question we just received on our [Brent Cyclists] Yahoo! group was: "What is a good way to cycle from Dollis Hill to Stanmore?" This cyclist has been on the TfL journey planner, and selected "bike only", and got the suggestion to go up the A5 and over the Staples Corner flyover (where speeds are often in excess of 50mph) with it's terrifying low angle of merging motorway-style slip roads. And one has to answer his question, sorry, but it isn't actually possible to cycle from Dollis Hill to Stanmore by an acceptably direct route without going through feasome motorway-style junctions, or breaking the law and riding on pedestrian bridges and pavements. Brent south of the A406 North Circular road is completely cut off from north Brent and the outer suburbs, that is the way it is, and no-one in government seems to have a clue how to address that problem, or even to understand what a problem it is. So, there's a fundamental problem with cycle promotion in this country. It's all upside-down, cart before horse. Government keeps telling people to cycle before the facilities are put in place to make it feasable, safe, and attractive – and, in fact, without there ever being a serious intention to make it so. We keep having cycling festivals and this and that cuddly thing, without ever having done the hard stuff, without having actually built the routes. The so-called soft and hard measures are in the wrong order, which will never work. Logically, it is completely crazy. Translated to another form of transport, it is as if we were railway promoters spending all our budget on advertising our wonderful railway, telling people to use it, but we don't build it, it just doesn't exist. It's just nuts. Well, maybe as a nation we can't afford to buid proper cycle routes. But it seems we can afford to do the promotion. And advertising doesn't come cheap. Advertising budgets are measured in millions. The cost of, say, a cycle bridge across the North Circular would be millions too. But that would be millions well-spent, it would be a permanent piece of cycle promotion which would not disappear when the poster boards are resurfaced. And if it worked, it would continue working indefinitely – what an investment. The sad truth is that the cynical, but realistic reply to the qustion about cycling from Dollis Hill to Stanmore is that the best way to do that is to take a folding bike on the tube and cycle the last bit from the station, or, leave a cheap bike permanently at the far end. The tube and railways are how most sensible Londoners without cars cross the North Circular barrier. Just imagine if the tube lines stopped at the North Circular, how divided London would be. That's what we have in cycling terms. We don't have the network, and we are wasting money telling people to use a mode of transport that is not practical. My friend Paul Gannon, who had lived in The Netherlands for a time, and then came back to London and pioneered campaigning for segregated cycle routes in the UK at a time, in the late 1990s, when that was totally unfashionable with the cycle campaign establishment, indeed, looked upon with horror and opposed at every possible turn, used to say that the trouble is that the UK is, in cycling terms, like a partying teenager who won't do any work. We are always having the celebration of cycling first, but somehow never getting down to work on the environment needed to get ordinary people cycling. That was more than 10 years ago, but, frustratingly, nothing changes. I have just seen this press release from "Team Green Britain". Don't worry if you can't be bothered to read all of it, just scroll through it, as it's just typical UK cycle promotion happy-clappy committee-written tosh. Team Green Britain Bike Week, the UK’s biggest mass participation cycling event, launches on 15 June at the EDFEnergy London Eye, with the first of hundreds of ‘Bike Fixes’ which will roll out around the country between 18-26 June 2011. Spike Taylor, former Team GB chief mechanic, will kick off ‘Britain’s Biggest Bike Fix’ with Dawn Porter, Olympic gold medal winning cyclist Ed Clancy, and a number of MPs from various parties at the annual All Party Parliamentary Cycling Group bike ride. The ride will start at the EDF Energy London Eye and takes the riders on short trip around Westminster before finishing at the House of Lords. Team Green Britain Bike Week is aiming for ‘Britain’s Biggest Bike Fix’, an ambitious attempt to mend over 10,000 bikes and liberate the multitude of unused bikes from sheds across the country – by encouraging people to dig them out, get punctures fixed, brakes adjusted and gears tuned at events around the country. Phillip Darnton, Chairman of the Bicycle Association says: “We know that 77% of people in the UK own a bike, but only 14% use them regularly and a major barrier to people getting back on two wheels is often something as simple to fix as a dodgy brake or puncture. “So we want anyone with a bike, who wants to get it roadworthy, to help make Team Green Britain Bike Week become ‘Britain’s Biggest Bike Fix’. We are urging new and lapsed cyclists to check out www.bikeweek.org.uk to find out details of their nearest event to re-discover how cycling helps you get fit, have fun and feel free”. Dawn Porter, TV presenter and keen cyclist says: “Cycling is my favourite way to get around town but I never leave home without my trusty puncture repair kit and Allen key! I encourage everyone to get to a Team Green Britain Bike Week event to pick up a few useful cycle maintenance tips and take advantage of the bike fixes to help you make the most of cycling in the summer months”. This is the second year in which Team Green Britain, founded byEDF Energy in 2009, has supported Bike Week. 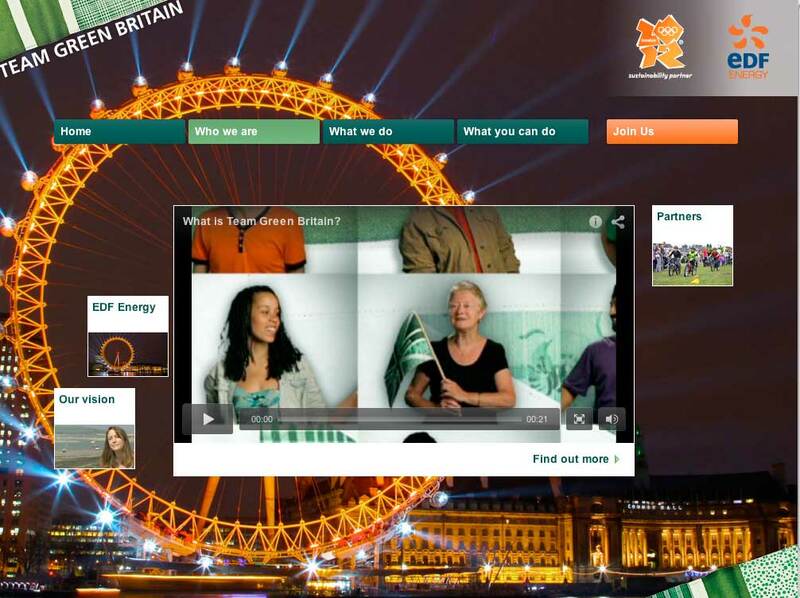 Team Green Britain is an online community that aims to enable people to live in a more sustainable way. Team Green Britain is now comprised of over one million members. Team Green Britain and Bike Week are again working together to inspire Britons to reduce their carbon footprint and promote low carbon transport solutions to a wider audience than ever before. Gareth Wynn, Group Director, 2012 Programme at EDF added “As the first Sustainability Partner of London 2012, EDF Energy founded Team Green Britain to help Britons reduce their carbon footprints ahead of the Olympic and Paralympic Games. Travelling contributes significantly to most people’s carbon footprint, but cycling is a low carbon way to get around, plus it can be enjoyable and help you get fit at the same time. We’re hoping that Team Green Britain Bike Week will help people get back on their bikes, helping them reduce the carbon footprint of their travel in the long term”. Team Green Britain Bike Week runs from 18-26 June 2011 and is for everyone from total novices to passionate cyclists. The opportunity to get your bike fixed is just one of the attractions of the events – to find details of your nearest event visit www.bikeweek.org.uk. In 2011 Team Green Britain Bike Week is funded by EDF Energy and the cycling industry via Bike Hub. For more information about Team Green Britain, and advice and ideas to help you save energy and money, visit www.teamgreenbritain.org. Team Green Britain Website: just look at all that light pollution in the background. I don't call that "green". The reason I have just typed in capitals, is because I am trying to shout. I am angry about this. It has been much the same for decades, as David Henbrow noted, looking back in 2010 at the British National Cycling Strategy from 1996. The longer Team Green Britain, or any of the other organisations in the Environment Issue Avoidance Industry that is most of UK cycle campaigning (and, yes, this means you, CTC and CCN) keeps wittering on about how people are not cycling because they "lack training", or "lack confidence on the roads", or "don't know what to wear in wet weather" or "can't find the right routes" or "lack the skills to repair a bike", or any of these other bits of patronising tosh, the longer we delay solving the problem, the more years go by with derisory levels of cycling in the UK, the more money we waste on ineffective cycle promotion and pointless studies of cycling, the more people take up cycling and then quickly give it up again, the more people die of avoidable obesity-related health conditions and from the effects of pollution, the more we destroy our cities and countryside with motorways and concrete and car-parking, the more we live in de-humanised car-centric communities, the longer we fail to get to grips with transport-related CO2 emissions leading to more global warming. Please sign up to the Cycling Embassy of Great Britain's campaign for proper, effective cycle infrastructure in the UK. I think CTC and similar are basing their aims on adapting current conditions to improve them for cycling. I think they are guilty of not aiming high enough but maybe they are worried about alienating their members? While I'm coming round to the idea of dutch/danish style cycle infrastructure I still think "never gonna happen here"